In this splendid and playful volume — second of a trilogy — an acclaimed creative team presents examples of twenty-nine poetic forms, demonstrating not only the (sometimes bendable) rules of poetry, but also the spirit that brings these forms to life. Featuring poems from the likes of Eleanor Farjeon (aubade), X. J. Kennedy (elegy), Ogden Nash (couplet), Liz Rosenberg (pantoum), and William Shakespeare, the sonnet king himself, A Kick in the Head perfectly illustrates Robert Frost’s maxim that poetry without rules is like a tennis match without a net. Back matter includes notes on poetic forms. 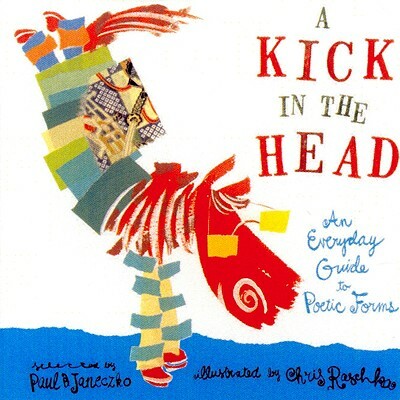 Paul B. Janeczko (1945–2019) was a poet and teacher who edited numerous award-winning poetry anthologies for young people, including A Poke in the I, A Kick in the Head, A Foot in the Mouth, and The Death of the Hat, all of which were illustrated by Chris Raschka; Firefly July, illustrated by Melissa Sweet; and The Proper Way to Meet a Hedgehog and Other How-To Poems, illustrated by Richard Jones. He also wrote Worlds Afire; Requiem: Poems of the Terezín Ghetto; Top Secret: A Handbook of Codes, Ciphers, and Secret Writing; Double Cross: Deception Techniques in War; The Dark Game: True Spy Stories from Invisible Ink to CIA Moles, a finalist for the YALSA Award for Excellence in Nonfiction for Young Adults; and Secret Soldiers: How the U.S. Twenty-Third Special Troops Fooled the Nazis. Chris Raschka is the illustrator of more than twenty highly praised books for children, including Yo! Yes?, a Caldecott Honor Book; Charlie Parker Played Be Bop; I Pledge Allegiance; A Child's Christmas In Wales; and, of course, A Poke In The I, which was a New York Times Best Illustrated Book. Readers will have the good fortune to experience poetry as art, game, joke, list, song, story, statement, question, memory. A primer like no other. The title poem proclaims that 'poetry jumpstarts . . . imagination'; this book shows how that's done. Janeczko's disciplined but accessible examples, plus Raschka's spirited Asian-inspired images, add oomph to this joyful poetry lesson, sure to be welcomed by teachers and aspiring poets everywhere. A beautiful, beautifully clear celebration of the discipline of poetry—and the possibilities offered by that discipline—this offering will find use both in the hands of eager poets and on the reference shelf.